The New York State legislature has chosen Barbara Underwood, the acting Attorney General, to replace the former AG Eric Schneiderman for the remainder of the term, which ends December 31. Underwood will be the first woman to hold that office. 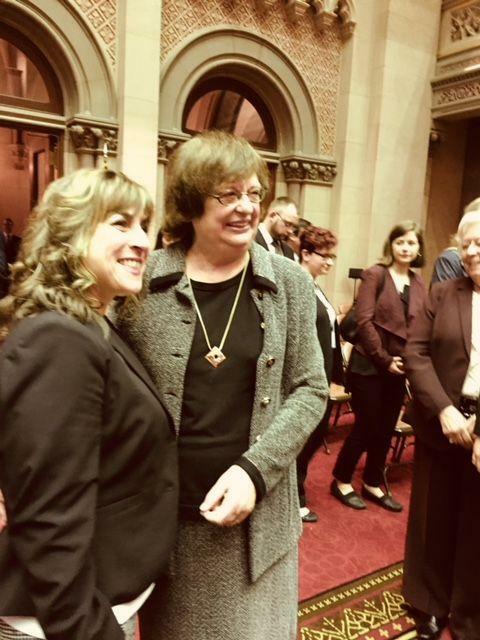 By a vote of 190 to zero at the joint session of the legislature Tuesday afternoon, Barbara Underwood became the first woman in New York’s history to hold the post of Attorney General. Underwood graduated Harvard University and Georgetown University , law school where she was first in her class, and was the first woman to hold the title of Solicitor General of the United states, when she served as acting solicitor general under President Obama. She was praised by legislative leaders, including Democratic Senate Leader Andrea Stewart- Cousins. “I’m certainly happy that she will be breaking yet another glass ceiling , ” Stewart-Cousins said. 12 candidates interviewed for the appointment, and Assembly Speaker Carl Heastie says they were all qualified, but he says in the end, his Democratic members agreed with Republicans in the State Senate that Underwood, the former solicitor general and acting attorney general, would be best to fill out the remainder of the term. “We just thought for the stability of the office and the time frame and the breadth of Ms. Underwood’s resume that there was consensus among the members to formally select Ms Underwood and to let her fill out the rest of the term,”Heastie said. Underwood has pledged not to seek election to the office, and is viewed as a capable interim placeholder. She’s already committed to carry out hundreds of legal actions begun by her predecessor, including ones against President Trump and his administration. “The most important thing I can do right now is to keep going,” said Underwood, who said the office is doing important work and there are “a great many investigations and cases” that are on going. “I think it’s also helpful after a moment of distress to dig into the work” she said. Eric Schneiderman resigned as Attorney General May 8th, after an article in the New Yorker magazine cited several women who said Schneiderman repeatedly physically assaulted while they were dating. Schneiderman denies the allegations, saying he was engaging in consensual role playing. The two major party political conventions begin Wednesday, and the leading Democratic and Republican candidates for Attorney General did not apply for the legislative appointment. Even though the state’s constitution requires that the legislature chose an Attorney General or State Comptroller whenever the posts are vacant, some potential political candidates feared it would look too much like an insider deal if they sought an appointment to the post before running in November. Spekear Heastie defended the process on the assembly floor. Candidates include, on the Democrats’ side, two women, New York City Public Advocate Tish James and former Cuomo counsel Leecia Eve. Both are African American. Governor Cuomo is endorsing James for the office. He appointed Underwood as solicitor general back in 2007, when Cuomo was himself the state’s Attorney General. There are several Republicans who also want to run for the office.